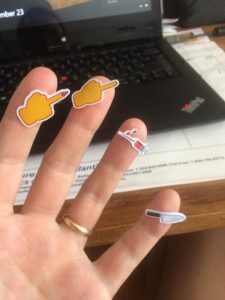 Almost two years ago I penned a post where I whined about the fallout from kids’ birthday parties; jeers, tears, and beers always followed those overstimulating, sugar-filled two-hour fiestas. I’m pleased to say things have improved markedly when it comes to behavior during and post friends’ parties, however, hosting a shindig continues to be a grade-A shitshow. Enough time has passed since our most recent “celebration” that I can finally talk about it without feeling the need to stuff my mouthhole full of chocolate and cry into a pillow. As I cannot say the same with regard to the results of our recent presidential election, I'll stick with the funnies for the near future. Last year we skipped throwing a party for young EK, then five, because we’re terrible parents we had a lot going on. Thus, my “mom-guilt” put me into full on self-loathing mode come August 2016. Junior Ninja Warriors plus 15 guests ages 4-12 seemed like a solid choice for parents and kids alike. 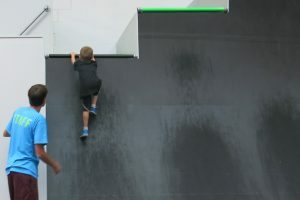 I mean, who doesn’t want to show-up their offspring on the warped wall? We arrived at the spot on its opening day with Pokemon cupcakes dotting trays and an armful of BS goodie bags (which contained a few inappropriate emoji stickers - WHOOPS!) The excitement was palpable; with signed waivers and shoes doubled-knotted the kids rushed in. The overwhelming nature of overlapping social circles. I could see him assessing the room in an effort to figure out how to talk to all of his friends at once. So EK and I ended up outside for a good 20 minutes. He wanted to go home. So did I. Badly. I’m not going to lie, I teared up with the old man. Partly out of frustration but also because the kid was so sad on his own birthday. His head was exploding from so much stimulation and we didn’t see it coming. Also, I was repeatedly informed that I “ruined his birthday,” which made swiping my credit card all the more painful. After breathing returned to a normal rate, he and I decided to try it out one more time. Soon enough, EK was slamming his head into the inflatable climbing wall like a boss while I drank some veggie dip. Here’s to six-year-olds and their sometimes-obtuse parents. Next year we’re doing pizza and a movie with four friends to celebrate his rotation 'round the sun.